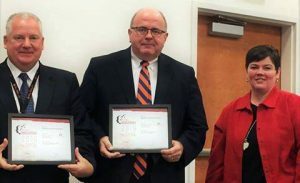 Gwynn Stewart (pictured right), communications director for the Buckeye Hills-Hocking Valley Regional Development District, presented Ohio Valley ESC Superintendent Chris Keylor (left) and Muskingum Valley ESC Superintendent David Branch (center), with a 2016 Innovation Award from the National Association of Development Organizations (NADO) for their roles as project leaders of the Appalachian Ohio P-20 Council. NADO’s Innovation Awards program recognizes regional development organizations and their partners for improving the economic and community competitiveness of our nation’s regions and local communities. The 2016 class of award recipients consisted of projects spanning 28 states! Congrats to the Appalachian Ohio P-20 Council!